DuckDuckGo is an internet search engine that launched in 2008. During its early years, the search engine's strong focus on user privacy and anonymity attracted a loyal niche following which has since grown significantly to around 36 million daily private searches worldwide as of early 2019. 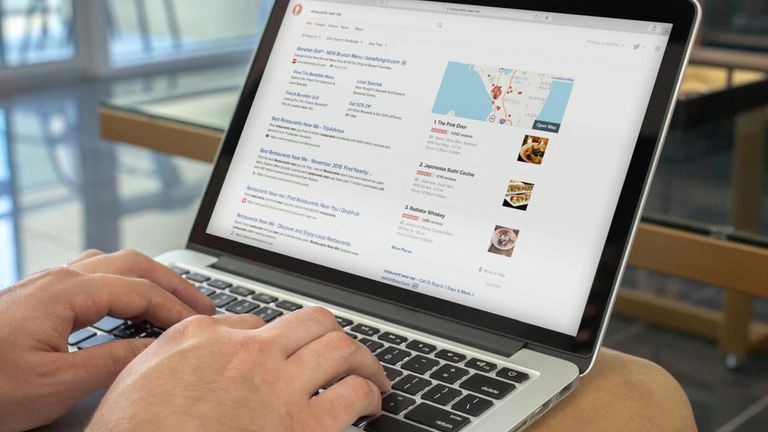 In addition to the typical website search results, DuckDuckGo also features integrations with Yelp and Apple Maps to offer business listings and embedded maps in search results. This functionality is often referred to as DuckDuckGo Maps and works in much the same way as similar map features on rival search engines such as Google and Bing. DuckDuckGo Maps is integrated directly into the main DuckDuckGo search engine and can be accessed simply by searching for a business or location. Searching for a generic phrase such as café will result in various websites about cafes with no map data. To get a DuckDuckGo Maps result, try adding a city before the target word. Type in New York café, for example, to obtain results in that area. You can also search for café near me to browse cafes closer to your current location. After the search has been processed, a small map will appear on the right side of the screen. Click Open Map or on the map itself to view a larger version. Businesses or locations relating to your search phrase will appear on the left side of the screen and on the map itself. Selecting a location listing will display user reviews and a variety of photos powered by Yelp. You can zoom in and out on the DuckDuckGo Maps map by clicking on the plus and minus buttons in the lower-right corner of the screen. Here are some of the search query styles that can be used to get a DuckDuckGo Maps result. The full address of a location. A city, state, country, or region name. A type of business and a location. Any word followed by near me. How Does DuckDuckGo Maps Use Apple Maps? DuckDuckGo Maps uses Apple's MapKit JS framework, the backbone of the Apple Maps apps on iPhone, iPad, and other Apple devices. This functionality gives DuckDuckGo Maps the same address database and satellite imagery used in the main Apple Maps app but doesn't send any personal data, such as IP addresses, to Apple or any other companies. This is in keeping with DuckDuckGo's overall dedication to protecting user information with all activity on the platform. Data and location information is always anonymous and can't be used to identify any one user. This focus on privacy makes DuckDuckGo a good alternative for those who frequently use Apple Maps but are concerned about their data usage and how it's being used by third parties. Where Can I Use DuckDuckGo? The DuckDuckGo search engine is accessible in any web browser via its official website, with its apps on iOS and Android smart devices, and through the DuckDuckGo browser plugins which are available for all major web browsers. DuckDuckGo is also the default search engine for the private browsing modes in the Brave and Vivaldi internet browsers. It can additionally be set as the default search engine in other browsers by changing the relevant settings within the chosen browser app.